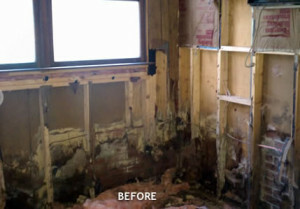 Water damage can happen to anyone – anyone can have a bathroom riser fail while they are at work. Anyone can come home to find 4-5 hours of water from a burst pipe or a failed riser. When water damage strikes, speed is of the utmost importance. 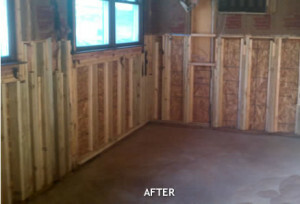 Significant additional property damage, such as mold growth and major damage to wood floors, cabinets, drywall, insulation and other structural materials and contents can occur when buildings are not dried quickly. Restoration Experts of North Carolina utilizes the latest in high tech inspection tools, including thermal imaging, to determine the extent of the damage. Using pumps, we extract the water, then we use fans and/or heaters to dry the structure is dried, all while extensively monitoring and documenting the process. We also specifically address any health hazards that can be associated with more severe categories of water damage. Clean Water comes from frozen or broken pipes, ice maker hoses, failed water heaters, roof leaks, etc. Grey Water is water that has been used to clean something and may contain contamination or soiling (food, laundry soils, body oils/soils, etc.). Grey water usually originates from washing machines, dishwashers, tub overflows, spas and the like. Black Water comes from toilet, sewer and septic system back-ups or overflows and contains human and/or animal waste. Thousands of disease causing viruses, bacteria and protozoa can be present in black water and serious illnesses can occur if not handled correctly. Contact us to find out what Restoration Experts of North Carolina can do to help facility and property managers prepare!